You feel you need a high level partner. You feel you need some help in management. You need an open and outside assessment. You feel the organization is drifting and listless. You must create a corporate sale or acquisition for stability. You don't have a functional CFO or other senior management and need one or more ASAP. If you are a middle market private or small cap public company, here are some of the reasons you might need to call us. 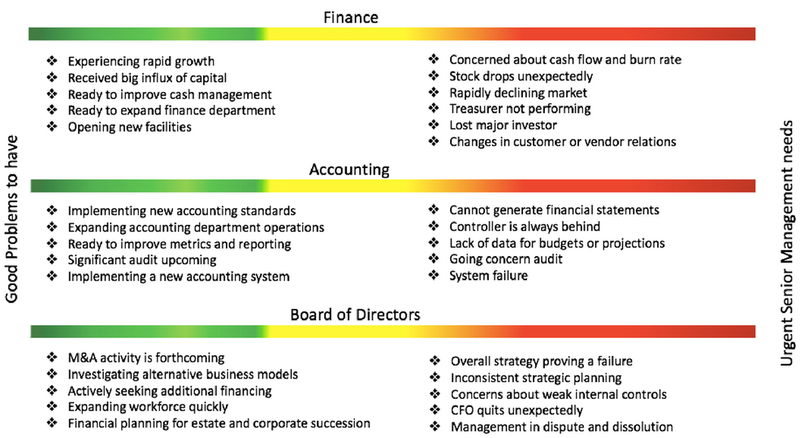 We consider items listed on the left (under the green) as good problems to have, but ones that definitely require CFO-level expertise to resolve. For the examples listed on the right (under the red), these are urgent moments when having the right CFO is imperative for the immediate health of your organization.